Breathing is, needless to say, rather important. We need to take air in so that the oxygen can be absorbed into our blood and delivered to our muscles, organs and brain. Once respiratory processes have completed, we then need to get rid of the waste product, carbon dioxide. 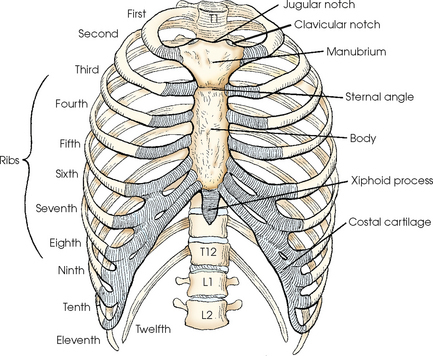 Our ribcage is the mechanical structure that facilities breathing and as it moves it draws the lungs with it since they are stuck to the under surface of the ribcage thanks to a capillary effect. In order for the ribcage to move however, muscles must engage. This is where things can get interesting. At rest, we breathe using only our diaphragm. This muscle forms a barrier between our torso and abdomen (barring three holes for an artery, a vein and the tube to your stomach), and at rest looks like a parachute. As it contracts it flattens out, but since there are organs underneath it (liver, stomach, intestines), the edges of the muscle are forced up and out. 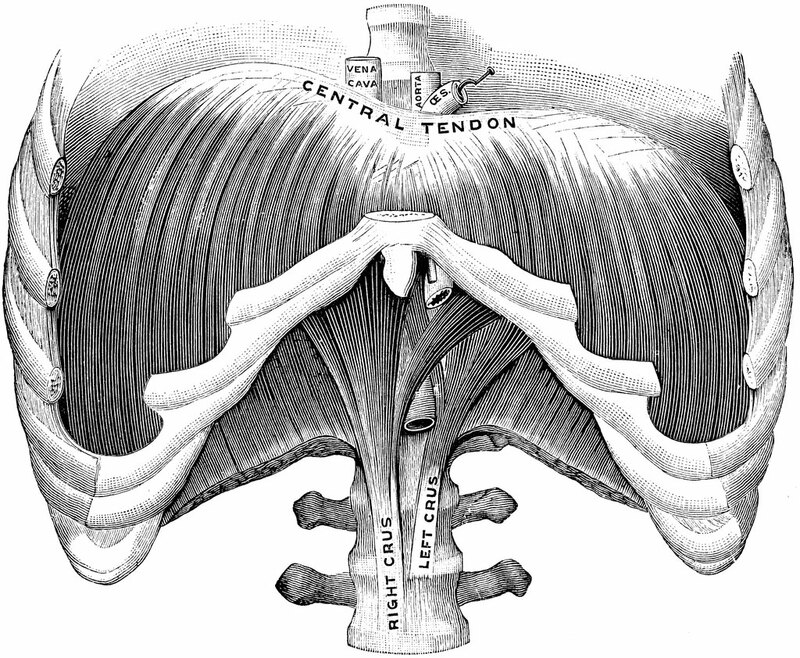 The edge of the muscle therefore pulls the lower ribcage outwards, increasing its diameter. The volume of the lungs increases, and the negative pressure created draws air into the lungs. This lateral movement of the lower ribs caused by diaphragm activity is called “bucket handle” movement. Simple, right? However, when we need more oxygen we start to use additional muscles to create greater expansion of the ribcage and therefore increase the capacity of the lungs. Muscles around the shoulders and neck start to pull on the upper ribs that make up your ribcage. 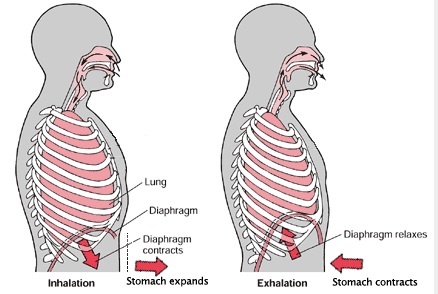 This lifts the ribs anteriorly, increasing lung capacity, and is called “pump handle” movement. This is why you might put your hands on your head or on your hips when you’re out of breath, as by fixing your arms, your shoulder muscles can now work “backwards” to help move your ribcage. The list of muscles that has a role to play in breathing is pretty extensive, but it’s important to recognise that at rest the only muscle that needs to work is the diaphragm. 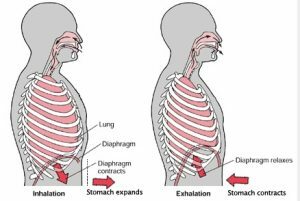 This not only helps us to keep using the whole capacity of the lungs – right down to the bottom, but the motion of the diaphragm also helps massage all the organs lying underneath, keeping organs like your liver and intestines healthy. Low back pain can be created by holding tummy muscles too tight. This affects natural breathing, and the change of pressure in the abdomen can press the low back into a posture that causes pain. Shoulder and neck pain can be caused by too much upper rib (pump handle) breathing. The muscles get exhausted keeping you breathing, and have nothing left to help shoulder and neck movement. Generalised muscle aches and other systemic symptoms can be caused by poor breathing, since excess carbon dioxide that is not being exhaled efficiently will make blood acidic. This can have pretty catastrophic effects on the body, especially since blood pH is critical for enzyme function. If you think your breathing is affecting you, or have unresolved pain, our therapists are here to help. Call the clinic to make an appointment.